The 2016 U.S. Presidential elections marked the transition from a government led by the Democrat Barack Obama to a government headed by former businessman and TV-star, Republican Donald Trump. The candidacy – and subsequent victory – of Mr. Trump shocked many Americans and non-Americans, and his debates against the Democrat Hillary Clinton were followed by the entire world. In a context of uncertainty, economic hardships and general dissatisfaction, Trump’s anti-establishment policies were what Americans needed. Clinton had the endorsement of Barack Obama while Trump fiercely opposed Obama and all its policies. People who were tired of the weak and corrupt ruling class. Trump’s anti-establishment ways and ideas gained the trust of voters who believed that the new, strong candidate could “make America great again,” and who were not scared by Trump’s radical proposals. 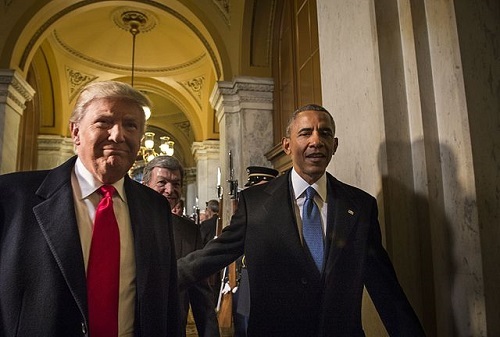 Donald Trump and Barack Obama have different views and beliefs on almost every issue, including individual rights, domestic policies, foreign policies, immigration and economy. Furthermore, the two are candidates of the two historically opposing parties: Obama is a Democrat while Trump is a Republican. Therefore, Obama is (and was) moderately liberal while Trump is slightly more conservative (very conservative in some cases). Both agreed with maintaining God (religion) in the public sphere. According to Trump and his voters, Obama did not do enough to eradicate terrorism and violent extremism while Trump signed two different executive orders to prevent people from seven (later six) Muslim majority countries from entering the United States. The first 100 days in office of a newly elected president are a critical period of adjustment. Barack Obama and Donald Trump spent their first 100 days doing very different things. Number of golf outings: in his first 100 days, Barack Obama played golf once (although some sources say he never played in this period) while Donald Trump played 19 times. Not only do Donald Trump and Barack Obama differ in their political views and political strategies but they also have very different lifestyles. The Obama family was – and is – the model of a modern happy family, while Trump’s sexist comments on women as well as his public behaviors cast doubts on the relationship between the President and his wife. After eight years of Obama administration, Americans needed and wanted change – it is not surprisingly, then, that the anti-Obama won the elections and became the 45th – and probably the most controversial – President of the United States. Giulia Squadrin. "Difference between Donald Trump and Barack Obama." DifferenceBetween.net. August 23, 2018 < http://www.differencebetween.net/miscellaneous/politics/difference-between-donald-trump-and-barack-obama/ >. I could not have said it better myself my friend. Gee, folks, do you think you could have used any more emotionally charged words & phrases? Maybe you could have made your LeftBias a bit more noticeable? The image projected of Comrade-Imam Obama as a smooth, urbane, “moderately liberal,” happily married family man is as bogus as most of MSNBC’s so-called news. Ditto the projected image of President Trump as a narcissist and egoist — bogus. I know it will be difficult, perhaps even painful for you people; but think about this: Mr. Trump had nothing to prove — nor did he need more money — when he became Candidate Trump. As President, Trump endures a highly proscribed lifestyle; lives in (an albeit historic and exalted) home that is far less grandiloquent than his digs in Trump Tower; and who donates his entire salary to either a private charity or some governmental function each quarter. The perfidy of the Left is mind boggling– and prurient. The election of Trump to the highest office is a tragedy of monumental proportions, unequalled in American history and unrivalled in its sheer stupidity. That you seem to have fallen to the whims and caprices of a malignant narcissist who has failed every ethic test in the presidential book, who is constantly using his position to line his pockets and doesn’t hesitate to throw anyone under the bus ( no matter how loyal) to save his orange skin, as educated-sounding as you are is an eye-opener that education does not buy common sense. Four years of Trump will irretrievably damage the fabric of our very existence and beliefs. For the sake of the greater good, he needs to step down quickly. In the end, history indicts, history vindicates and history validates. Its neither up to you nor I nor Fox News (thank god) to make that call. I have no iota of doubt that history will judge him as the worst president in modern times. He had nothing to prove? How about proving you can be a role model, a Uniter, a compassionate person to the less fortunate as a wealthy man. He had something to prove within himself, power. And he’s done it well, he’s brain washed so many people. I have asked over and over again, “ ok, so he’s made a better economy”, in what way have YOU benefitted from it. I still can’t get a tangable answer from no one!